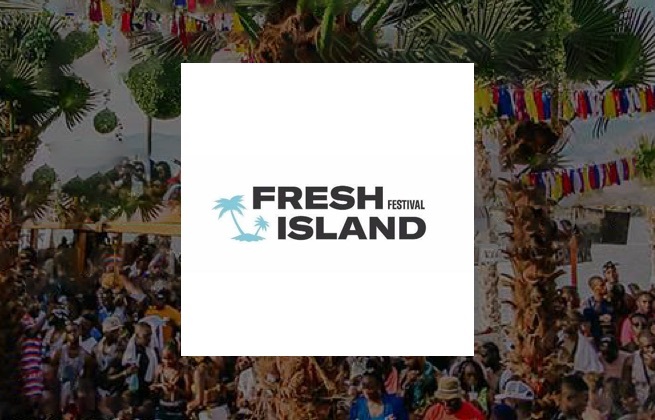 Access to Fresh Island Festival 2019 on 15-17 July 2019. You will be able to enter the festival areas at Zrce beach during the festival. Entrance to VIP areas, pre-parties, after-parties and Boat parties is not included. VIP access to Fresh Island Festival 2019 on 15-17 July 2019. You will be able to enter the festival areas at Zrce beach during the festival and entrance to VIP areas. Pre-parties, after-parties and boat parties is not included. 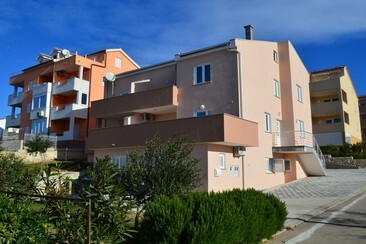 Apartments SAND are some of the most beautiful apartments located in Novalja, the second largest town on the Croatian island of Pag. Apartment is located 500 meters from the city centre, 400 meters from the sea side and 450 meters from the nearest bus station. 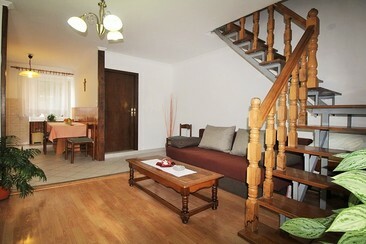 Sandy apartments are fully equipped with air conditioning, wi-fi (wireless internet) and a balcony/terrace. 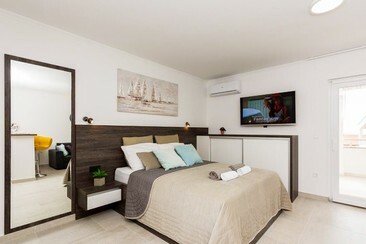 These apartments also contain additional appliances such as TVs. Guests are guaranteed a parking spot for their personal vehicle. 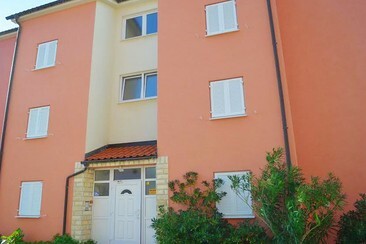 Amore Apartment is located in the city of Novalja, the second largest town on the Croatian island of Pag. Standard apartments consist of one or more large bedrooms, living room with sofa beds, dining area and equipped kitchenette, bathroom and a balcony or terrace. Wifi and air-conditioning is available. Car parking is available if you travel by car. The centre of Novalja has array of shops, restaurants and bars, including supermarkets. Zrće Beach, known as the Croatian Ibiza, and Club Papaya, are only few kilometres from the apartments and can easily be reached by car or bus. Apartment Atilio is a six-person apartment which consists of two floors. It is located in the heart of the town, right in between two of Novalja's main squares and is very close to the town's strip which houses all of its nicest restaurants and cocktail bars. It consists of two bedrooms, two bathrooms and a living room area with a sofa bed for two people. The apartment has a rustic interior and is fully equipped with air conditioning, wi-fi (wireless Internet) and a nice and cosy balcony. TV is also offered as an addtional appliance. Guests are welcome to use a parking lot located 150 meters away from the apartment. A one-way airport transfer departs from Novalja parking lot (across mail bus station in Novalja) and arrives to airport (in front of arrivals terminal). All vehicle will have sing with Fresh Island festival, and our staff will help you to get on coach. Please be there 15 min before departures from Novalja. If you delay, we can wait for you. A one-way airport transfer departs from airport (in front of arrivals terminal) and arrives to Novalja parking lot (across mail bus station in Novalja). All vehicle will have sing with Fresh Island festival, and our staff will help you to get on coach. Please be there 15 min before departures from Novalja. If you delay, we can wait for you. Save your energy for partying & don't waste it on a 45 min walk to Zrce beach! TAKE THE BUS! Owning a shuttle bus wristband is the easiest and cheapest way to get around the island including the festival site. Taxis are not always available and not all drivers are insured as official taxis, save money and stay safe with an official festival shuttle bus when traveling around the island. Comfortable, private and convenient transfer A private airport transfer for up to 7 people from Zadar / Split / Zagreb aiport to Novalja. Comfortable, private and convenient transfer A private airport transfer for up to 7 people from Novalja to Zadar / Split / Zagreb aiport.